November 7, 2000. In cities and towns across America, before heading off to work, during lunch break, or after another day at the office, people went to the polls to cast their votes for the next president of the United States. (All told more than 105 million people voted for president, but some voted during early voting periods or by absentee ballot). About as many eligible voters did not vote, citing reasons such as being too busy or unable to get time off, lack of interest, the sentiment that "my vote doesn't make a difference," inadequate knowledge of the candidates or dislike of the candidates. As subsequent events showed, however, in this election each and every vote was critical. What the viewer sees on election night, and in the newspaper the next morning, is the culmination of months of preparation and planning. A key entity in bringing the results to the nation is Voter News Service, a cooperative formed by ABC News, the Associated Press, CBS News, Cable News Network, Fox News and NBC News. VNS performs two distinct functions. First, it does Election Day exit polling, surveying voters in randomly selected precincts as they leave polling places. On November 5, 1996 VNS's national exit poll surveyed 14,651 voters in 300 randomly selected precincts. VNS also does individual state exit polls. Exit polls provide a window on the concerns of voters and useful information on variations in voting behavior by gender, race, age, education, income and other factors. VNS's second function is to collect, tabulate and distribute unofficial election night vote results for presidential, Senate, House and gubernatorial races. VNS works with election officials in every county in the country to gather these results. On election night, stringers and reporters in tens of thousands of precincts around the country call in reports to VNS, which then processes and transmits the information. At some point in the evening, the outcome has become apparent to all, not just those with access to the exit polls. The defeated candidate calls the victor to concede and then delivers his or her concession speech. The president-elect delivers his or her victory speech to jubilant supporters. The Morning After...What Does It Mean? The days after the election are peak season for pundits as they assess, analyze, discuss and debate the meaning of the results. Various interest groups offer their own post-election assessments, often using the opportunity to point to the impact their constituency had on the outcome or to launch some barbs at their opponents. As you will recall from high school, the president is not selected by direct popular vote, but by intermediaries known as electors. The electoral system is outlined in the Twelfth Amendment to the Constitution, adopted in 1804 (this significantly modified the original provisions contained in Article II). Each state has a number of electors equal to its number of congressmen and Senators. The District of Columbia has three electors, bringing the total to 538. Most states use a winner-take-all rule; all the state's electors go to the winner of the popular vote in the state. Electors are generally party activists. Some months before the election each party puts together a slate of electors, chosen by congressional district with the exception of the two at-large Senate slots. If the party's presidential candidate wins the popular vote in the state on Election Day, its electors meet in the state capitol on the first Monday after the second Wednesday in December 2000. If not they stay home. Gathering for the mid-December ceremony at the state capitol, electors sign the certificate of vote--actually they sign several copies of the document so there are back-ups. There are separate votes for president and for vice president. Each state sends one copy of the certificate of vote to the Office of the President of the United States Senate. Finally, on January 6th, in a special joint session of Congress these envelopes are opened and tallied and the outcome of the election is officially certified. Normally this is a routine affair. Because of the Florida controversy, some Democrats [Democrats.com] still had not given up on January 6, 2001 even though Vice President Gore had conceded. Members of the Congressional Black Caucus tried to get Congress to reject Florida's electors, but they could not find a Senator to support their effort [as required by 3 U.S.C. Sect. 15]. Jan. 6, 2001--Vice President Al Gore presided over the joint session of Congress that certified George W. Bush as the winner of the 2000 election. Source: Committee for the Study of the American Electorate. 2000 figures from Census Bureau and FEC. 1. For the five presidential elections from 1952-1968, turnout hovered around 60%. 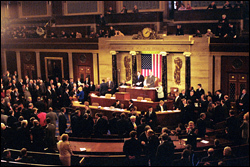 The House Subcommittee on Telecommunications, Trade & Consumer Protection (Commerce), chaired by Rep. Billy Tauzin (R-LA), held hearings on the effects of the networks' election night projections on Feb. 14, 2001. CNN commissioned an independent review panel which produced a report [Joan Konner, James Risser, and Ben Wattenberg. "Television's Performance on Election Night 2000: A Report for CNN," Jan. 29, 2001] (PDF format), and it is instituting new policies for election night coverage. National Election Studies NES "Guide to Public Opinion and Electoral Behavior"
Copyright 1998, 1999, 2000, 2001 Eric M. Appleman/Democracy in Action.